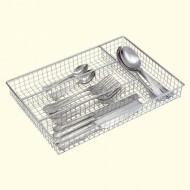 Drawer Organiser ADDIS 15 X 15.75ins..
Chrome Cutlery Caddy. (Cutlery not included.).. Hard-wearing Plastic Cutlery Tray. 21" X 13" .. Plastic Cutlery Tray 16.5 X 14.5ins..